5Mp for under £100, so where's the catch? You can walk into some branches of Tesco nowadays and pick up a 5Mp camera for well under £100, but not with a quality badge on the front, and big names in photography don't come much bigger than Kodak. In spite of its meagre asking price, the C360 is nicely styled, well put together and offers a wide range of intuitive features, living up to its 'EasyShare' title. On paper, the feature set looks a little humdrum, with a lack of advanced metering and exposure modes, straightforward focus options and only a 3x optical zoom lens. Dig a little deeper though, and you're rewarded by no less than 16 scene modes for making the most of tricky shooting situations, 640x480 pixel movie capture and a wide sensitivity range from ISO 80 to 800, although the highest of these is only available in low-resolution mode. There are also some colour setting alternatives, including sepia and black & white, as well as high, low and natural 'colour' options. 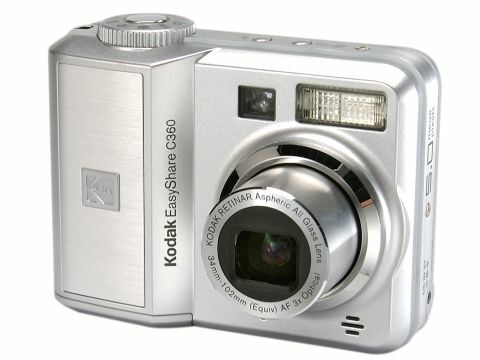 Surprisingly, at the price, the Kodak has 32MB of built-in memory as well as compatibility with the now almost ubiquitous SecureDigital and MultiMedia Card memory formats. For power, it'll return about 150 shots from a pair of standard AA batteries, which can come in handy on your holidays as you can get replacements just about anywhere if they go flat. To be honest, we weren't expecting much in the way of performance, considering the C360's price tag. We were very pleasantly surprised. The all-glass Aspherical Kodak Retinar lens proved pin-sharp and colour rendition was extremely good, while photos had plenty of contrast even in the dullest of shooting conditions. For indoor shooting, photos remained uncommonly noise-free, even at ISO 400, and flash photography also maintained an impressively natural look.